The HP Color LaserJet CP4005 printer series is composed of two model variations of the same hardware: one with a built in duplexor and one without. These color laser printers are at the top of their product category and come at an affordable price, while boasting rapid print speeds and a comprehensive feature set. With print speeds of 30 pages per minute for black and white and 25 pages per minute for color, the HP Color LaserJet CP4005n keeps pace with the current standard of color laser printing performance, which has improved significantly in the past five years. Both the HP Color LaserJet CP4005n and HP Color LaserJet CP4005dn models come complete with networking capabilities which allow an entire small office to share in the luxury of true color laser printing, but only the CP4005dn model includes and internal duplexor. With built in duplexing, users can take full advantage of their color laser hardware by printing two sided output automatically. This is an excellent feature for creating not only unique looking, professional booklets, but also colorful single page brochures, pamphlets, and cards. Duplexing also helps to cut costs by reducing paper usage by as much as half. The only other difference in the duplex ready model is a boost in included memory. The HP Color LaserJet CP4005n comes complete with 128 MBs of internal memory, which is just barely enough for handling color laser prints. Smart users who intend to use the printer to handle complex printing processes such as mixed text and color imagery will benefit from a possible upgrade in memory up to a total of 512 MBs made possible by a single DIMM slot. The CP4005dn model comes with an extra 128 MBs included for a total of 256 MBs standard. The HP Color LaserJet CP4005n does everything one would want a color laser printer to do, and its downsides, though annoying, are unavoidable. 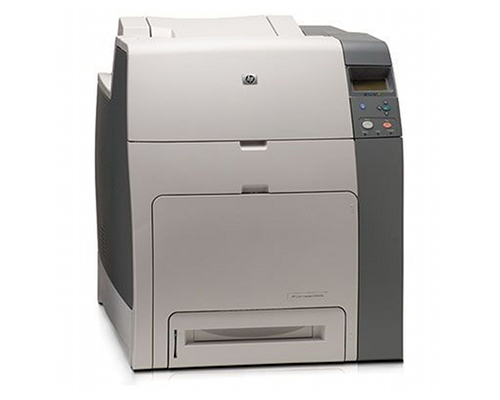 Like many color laser devices, the HP Color LaserJet CP4005n is ridiculously large and heavy. Its weight of 105.1 pounds makes it a difficult setup and too cumbersome for most home offices. Its dimensions of 20.5 in. x 23.5 in. x 22.9 in. (W x D x H) are also very restrictive. 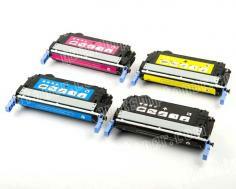 Another problem owners of the unit will face is the often very spendy cost of color toner, which can add up fast. 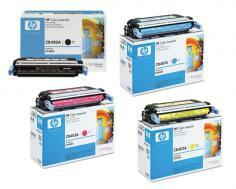 Review it: "HP Color LaserJet CP4005n "
The four color toner cartridges required to operate the HP Color LaserJet CP4005n and HP Color LaserJet CP4005dn printers are quite costly, but offer buyers a fairly high page yield per cartridge. Black, cyan, yellow, and magenta cartridges for the device each offer 7,500 pages of yield at 5% coverage, and four cartridge bundles are available to help reduce cost. Another consumable that is available for these printers is the fuser unit itself. While many laser devices include fusers designed to last the life of the printer or MFC, the HP Color LaserJet CP4005n comes with a fuser designed to operate for 120,000 pages, and replacement fuser units are available for those who surpass this amount.